The Sheldon Coin Grading Scale is a 70-point coin grading scale used in the numismatic assessment of a coin's quality. The American Numismatic Association based its Official ANA Grading Standards in large part on the Sheldon scale. The scale was created by William Herbert Sheldon. In 1949, the original scale was first presented in "Dr. William H. Sheldon's Early American Cents" titled "A Quantitative Scale for condition" as a way to grade Large cents. The scale is known today as the Sheldon scale. By 1953 the original Sheldon scale had become outdated. It was not until the 1970s, however, that the ANA chose to adapt the scale for use on all US coins. The scale used today is a modification of the original Sheldon scale, with added adjustments, additions, deletions, and modifications to it. Note: Some early American coin varieties are almost always found to be weakly struck in places. This does not bring the grade of these coins down as in some cases no flawless coin exists for the variety. Early coins in general usually have planchet quality issues which depending on severity and market conditions can bring the grade down for other coins. 1 Poor PO Clear enough to identify, date may be worn smooth with one side of the coin blanked. Coins that are very badly corroded may also fall under this category. 3 - 3.5 About Good, Almost Good AG Readable lettering although very heavily worn. The date and design may be worn smooth. 45 Choice Extremely Fine Ch. Ex. Fine, EF45 Slight, overall wear is seen at the highest points of the coin (examples being raised features). All the details are full and very sharp. Mint luster may show only in protected areas of the coin's surface (Such as between the star points). Coin dealers and individual coin collectors often use adjectives—with or without an accompanying Sheldon numerical code—to describe an uncirculated coin's grade. The term Brilliant Uncirculated (often abbreviated as BU) is probably the most common—and the most ambiguous—of such adjectives. While Brilliant Uncirculated (BU) ought to refer to an uncirculated coin that retains its original mint luster, some equate BU with Uncirculated, i.e., they might refer to an MS-60 coin with little or no effulgence (brightness) as Brilliant Uncirculated. Along these lines, some numismatists argue that an unscrupulous subset of coin dealers mislead customers by using adjectival grades without defining their terms. At the same time, there appears to be at least some consensus in the numismatic community for the following definitions. 60 Mint State 60 MS60 Unattractive, dull or washed-out, mint luster typify this coin. There may be many large detracting contact marks (bag nicks), or damage spots, but absolutely no trace of wear. There could be a heavy concentration of hairlines (minute scratches to a coin’s surface), or unattractive large areas of scuff-marks. Rim nicks may be present, and eye appeal is very poor. Copper coins may be dark, dull and spotted. 70 Mint State 70 MS70 The perfect coin, as minted. Has no trace of wear, handling, scratches or contact with other coins from a (5x) magnification. Coins in this grade are almost non-existent in older coins with very few examples known. Copper coins are bright with full original color and luster. Eye appeal is exceptional. Like circulated grades, proof coins are graded on the Sheldon scale from 1 to 70. Proof coins graded 60 to 70 are mirrored to those of Uncirculated grades with the difference that the coin was not made for circulation. Proof coins with the grade of Pr63 are sometimes called "Choice Proofs". Proof coins that are below the grade of 60 and show signs of circulation or mishandling have been classified as Impaired Proofs, these are not included alongside circulated coins as they were never issued or intended for circulation in the first place. 1 - 59 Impaired Proof N/A Grades for impaired proofs mirror those for circulated grades. 63 Proof Pr63 Grade mirrors uncirculated grade. 65 Proof Pr65 Grade mirrors uncirculated grade. 67 Proof Pr67 Grade mirrors uncirculated grade. 70 Proof Pr70 Grade mirrors uncirculated grade. The following table shows coins that have detracting features. Coin dealers will normally grade these coins at or below the ones shown for that respective type, the grades here depend on how bad the issue or issues are. Coins that are uncirculated as mentioned above can not go below an MS-60 grade. Adjustment Marks MS66 and lower These include mostly early coins, excess metal (such as silver and gold) was cut from overweight coins to conform to weight laws. Planchet defects MS65 and lower Planchet defects are caused by flaws in a coin's metal before it was struck. Some examples include; die cracks or lamination. Unattractive toning MS64 and lower Depending on conditions. Coins that have very low eye appeal will be effected as the market value of these coins cannot warrant a higher grade. Carbon streaks MS64 and lower Carbon streaks are a flaw caused by environmental conditions. Some contributing factors include coin storage in a damp place, or exposure to cigar or cigarette smoke. Fingermarks MS63 and lower Oils exist in human fingerprints which can leave marks on the surface of a coin. These marks are usually the result of mishandling. PVC damage MS63 and lower Improperly stored coins in vinyl 2x2 flips, older albums, and coin holders. Green and gray streaks and/or spots appear on the surface of an affected coin. Black spots MS63 and lower Also known as sulfur spots, these coins are given dark brown to black spots by sulfur in the environment. These black spots have also been incorrectly dubbed as carbon spots, but carbon does not contribute to oxidation. (aka "rub") MS63 and lower Slide marks are caused by improperly placing a coin into an album that contains plastic strip slides. The marks are given as the plastic slides or rubs across the surface of a given coin. Overdipping MS62 and lower These coins were dipped into a dilute acid solution too many times which stripped the coin's surface of luster. Corrosion spots MS62 and lower Copper coins can turn green, while silver coins turn black from oxidation. Wear AU58 and lower By definition an uncirculated coin will show no trace of wear. Whizzing AU50 and lower These coins were gone over with a metal or wire brush to "enhance" the uncirculated details. Whizzing causes wear to the surface of the coin which lowers the grade to "circulated" status. ^ Even longtime coin collectors sometimes do not understand the difference between uncirculated (mint state) and circulated coins. The key distinction is that circulated coins show signs of wear. In this regard, it may prove helpful to review the definition of wear from the Oxford English Dictionary: wear n. - "The process or condition of being worn or gradually reduced in bulk or impaired in quality by continued use, friction, attrition, exposure to atmospheric or other natural destructive agencies; loss or diminution of substance or deterioration of quality due to these causes." [example quotation:] "This Scarcity will be farther increased by the Wear of Silver Coins, which has lessened their Weights considerably." ^ Sometimes coin sellers apply the term Brilliant Uncirculated to coins in the MS-60 to MS-62 range, which may or may not be accurate depending on how one defines Brilliant Uncirculated (as discussed earlier). For example, PCGS defines Brilliant Uncirculated as a "generic term applied to any coin that has not been in circulation. It often is applied to coins with little 'brilliance' left, which properly should be described as simply Uncirculated." Whereas Susan Headley states that a "... BU coin ... generally falls into the lowest MS grades [MS-60, MS-61, and MS-62] on the Sheldon scale." ^ Of course, it is also true that if a coin collector owns a coin graded MS-65 by one of the leading third-party grading companies, there is a distinct possibility that if the collector removed the coin from the protective holder ('slab') and submitted the coin for grading to one of the other leading grading services--or even to the same service--the coin could come back with a different grade, e.g., MS-66 or MS-64. ^ James F. Ruddy. Photograde: Official Photographic Grading Guide for United States Coins. Retrieved 2013-06-24. ^ Richard Giedroyc. The Everything Coin Collecting Book: All You Need to Start Your Collection ... Retrieved 2013-06-24. ^ a b "The ANA Coin Grading Scale". www.usmint.gov. Retrieved 2013-06-16. ^ a b "How United States Coins are Graded". www.pcgs.com/. Retrieved 2013-06-16. ^ "Strike". www.coingrading.com. Retrieved 2013-06-16. ^ a b Mike Sherman (April 19, 2016). "Difficult to Grade Coins – Part Three". Professional Coin Grading Service. Retrieved October 19, 2017. ^ "wear". www.oed.com (Oxford English Dictionary). Oxford University Press. Retrieved 2017-08-18. ^ Prior, Thomas (1729). Observations on coin in general With some proposals for regulating the value of coin in Ireland. Dublin, Ireland: printed by A. Rhames, for R. Gunne. p. 14. OCLC 938217893. ^ "Grading Draped Bust Cents". www.ngccoin.com. Retrieved 2013-06-16. ^ Ken Potter, Brian Allen. Strike it rich. Retrieved 2013-06-16. ^ Yeoman, R. S. (2016). Bressett, Kenneth; Bowers, Q. David; Garrett, Jeff (eds.). A Guide Book of United States Coins (Deluxe "Mega Red" ed.) 2017 ("The Official Red Book of United States Coins") (2nd ed.). Atlanta, Georgia: Whitman. pp. 627–631. ISBN 0794843921. OCLC 926062081. The majority of pieces surviving today are dated 1800, and nearly all of the AU or finer coins are of this date. ^ "How United States Coins are Graded". www.pcgs.com. Collectors Universe, Inc. June 12, 1995. Retrieved August 22, 2017. ... the designation BU (Brilliant Uncirculated) is frequently used to describe uncirculated coins. Because of the absence of a numerical grade, this term is ambiguous at best. Often, coins that are offered as BU may in reality be AU (About Uncirculated) by strict definition. ^ Enders, David. "Glossary". DavesCollectibleCoins.com. Retrieved August 21, 2017. Brilliant Uncirculated - Refers to a coin which has not been circulated and which still retains the majority of its original mint luster. Sometimes "Uncirculated" and "Brilliant Uncirculated" are used interchangeably. However "Brilliant" [should] not be applied to a coin which has significant defects impairing its eye appeal or which is lacking in luster. ^ Reynolds, Greg (2011-04-20). "The Advertising of 'Choice' or 'Gem' Uncertified Coins". CoinWeek. CoinWeek, LLC. Retrieved 2017-08-18. I am concerned that some advertisers in widely read 'print' coin publications are selling uncertified coins as 'Choice' (implied or thought to be MS-63 or higher), Very Choice (thought to grade MS-64), or Gem Uncirculated (thought to be MS-65 or higher) that do NOT come close to qualifying for such grades. ^ a b Headley, Susan (May 18, 2017). "What Is a "BU" Coin?". The Spruce. Retrieved August 18, 2017. Common adjective grading usually maps to the following Mint State grades: Uncirculated (MS-60, MS-61, MS-62): A technically uncirculated coin with abundant and noticeable defects such as bag marks and scrapes. It is usually accompanied by a poor strike and dull mint luster. Select Uncirculated (MS-63): An uncirculated coin with fewer deficiencies and better eye appeal been lower Mint State grades. Choice Uncirculated (MS-64): These coins have moderate distracting bag marks and/or very few, but noticeable, light scratches due to handling. Eye appeal will be good, but not outstanding. Gem Uncirculated (MS-65, MS-66): any uncirculated coin with only minor and light distracting marks or imperfections. Strike and eye appeal will be above average for the coin type. ^ a b "Coin collecting terms, slang, glossary". PCGS.com. Professional Coin Grading Service. Retrieved August 18, 2017. Choice Uncirculated - An Uncirculated coin grading MS-63 or MS-64. ... Gem Uncirculated - The adjectival equivalent of Mint State 65 or 66. ^ "BU (Brilliant Uncirculated) / Mint State". GoldBroker.com. FDR Capital LLC. Retrieved August 18, 2017. Uncirculated MS-60 ... Uncirculated MS-61 ... Uncirculated MS-62 ... Select Uncirculated MS-63 ... Choice Uncirculated MS-64 ... Gem Uncirculated MS-65 ... Gem Uncirculated MS-66 ... .
^ "What is an Adjectival Grade?". NGC.com. Numismatic Guarantee Corporation. Retrieved August 18, 2017. UNCIRCULATED is often paired with the additional qualifiers of BRILLIANT, CHOICE, or GEM. NGC considers BRILLIANT UNCIRCULATED to be any coins that would grade from 60-70 on the Sheldon Grading Scale. CHOICE UNCIRCULATED is considered to be any coins that would grade from 63 to 70 and GEM UNCIRCULATED is used for coins that would grade from 65 to 70. ^ "Coin Grading Tutorial". Heritage Auctions. Retrieved August 19, 2017. Coins with no wear at all are alternately referred to as Uncirculated (Unc. ), Brilliant Uncirculated (BU), and Mint State (MS). ... It is important to note that Uncirculated and similar terms refer only to the fact that the coin has no wear. The presence or absence of bagmarks, toning (discoloration), or a strong strike does not affect a coin's Uncirculated status, although such things can affect the numerical grade of the coin. ... Uncirculated (MS-60, 61, 62) ... Although most price guides will give a price for coins in MS-60 condition, in many cases this is a very unusual grade, with typical uncirculated pieces often grading somewhere in the MS-62 to MS-64 range depending on the series. Select Uncirculated (MS-63) ... Choice Uncirculated (MS-64) ... Choice Uncirculated is sometimes used to refer to a coin grading MS-63. Gem Uncirculated (MS-65, 66) ... Superb Gem Uncirculated (MS-67, 68, 69) ... Perfect Uncirculated (MS-70): An utterly flawless coin. ^ Bowers, Q. David. Grading Coins by Photographs (2nd ed.). Atlanta, Georgia. p. 1. ISBN 0794836879. OCLC 879642085. ... grading is, always has been, and will forever admit of a generous proportion of, old-fashioned opinion. What is Gem Uncirculated or Mint State-65 to one expert can legitimately be viewed as a lower grade, MS-64 by another expert, and MS-66 by yet another. This is because grading is interpretive, not an exact science. ^ "What Are Proof Coins? What Should You Know About Them?". www.coinnews.net. 2007-09-14. Retrieved 2014-03-05. ^ "Official ANA Definition of an Impaired Proof". coins.about.com. Retrieved 2013-06-16. ^ a b c Ken Bressett and A. Kosoff. Official A.N.A. Grading Standards for United States Coins Fifth Edition. American Numismatic Association. p. 34. ^ Mike Sherman. "Toning. Does it help, or hurt the value of a coin?". Professional Coin Grading Service. Retrieved October 19, 2017. ^ "Grades multiplied over years". Numismatic News. October 16, 2017. Retrieved October 19, 2017. ^ "PVC Damage on World Coins – What It Is & How to Avoid It". CoinWeek. October 24, 2016. Retrieved October 19, 2017. ^ "NUMISMATICS' GREATEST MISNOMER: CARBON SPOTS". www.coinbooks.org. April 18, 2014. Retrieved October 19, 2017. ^ Thomas E. Hudgeons, Jr. The Official Blackbook Price Guide to United States Coins 2014, 52nd Edition. Diversified Publishing. Retrieved August 25, 2017. 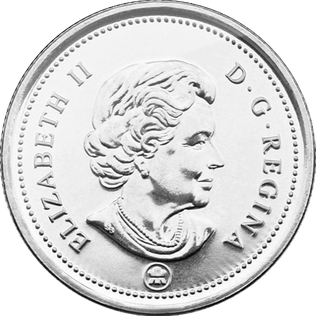 The fifty-cent piece is the common name of the Canadian coin worth 50 cents. The coin's reverse depicts the coat of arms of Canada. At the opening ceremonies for the Ottawa branch of the Royal Mint, held on January 2, 1908, Governor General Earl Grey struck the Dominion of Canada's first domestically produced coin. It was a silver fifty-cent piece bearing the effigy of King Edward VII. The Classic Head $2.50 gold coin is an American coin, also called a quarter eagle, minted from 1834-1839. It features Liberty on the obverse and an eagle on the reverse. Michael "Miles" Standish is an American businessman, author, rare coin expert, sports memorabilia expert and philanthropist. He is a co-founder of a provider of authentication and grading services of high-value assets. He currently serves as vice president of the Numismatic Guaranty Corporation (NGC).